Attended Taipei Physical Education College in Taiwan...attended the same middle school as former Dodgers reliever Hong-Chih Kuo (Chien-Hsin Middle School)...in 2007 was named by Time Magazine one of the "100 Most Influential People" in the world for helping break cultural barriers...in 2006 his uniform #41 was retired by the New York-Penn League. Split the season between the Yankees and Blue Jays organizations...during spring training was signed by NYY to a minor league contract...was released on 6/7 and 4 days later was signed by Tor to a 1-year contract...following the season became a free agent and on 12/18 was signed by the Reds to a minor league contract with an invitation to 2014 Major League spring training camp. Spent most of the season on the Nationals' disabled list...made 5 starts and 5 relief apps for Wsh...also made 15 rehabilitation starts for Class AAA Syracuse, Class AA Harrisburg and Class A Hagerstown and Potomac. Returned to big leagues after 2-plus year absence and went 4-3 with a 4.04 ERA in 11 starts for Washington ... gained strength and confidence with each start ... in final 9 starting assignments, finished 4-1 with a 3.71 ERA ... debuted with the Nationals on July 29 vs. ATL, more than 17 months after signing with Washington ... did not issue a free pass in final four starts or a franchise-record 23.2 innings ... with 6.0 scoreless innings of one-hit ball, earned the win in the Nationals' 3-1 victory on Aug. 9 at Wrigley Field (win was first at MLB level since pitching for NYY on June 28, 2009 at NYM) ... earned fourth win in a 4-1 victory over ATL, Sept. 24 in DC, to damage the Braves' post-season aspirations. Did not pitch in 2010 while working with the Nationals' training staff on a rehab program designed to regain full healthfrom July 2009 right shoulder surgery...did return to health in time to pitch in Instructional League in Sept. and Oct...in 2 FIL appearances, spun 3.0 no-hit scoreless innings, walking one and fanning one. In injury-ravaged season, went 1-6 with a 9.64 ERA in 12 games/9 starts for NYY...took loss in first 3 starts...enduredpair of DL stints due to hip abductor muscle weakness and a torn shoulder capsule, which was repaired by Dr. JamesAndrews in Birmingham, AL on July 29...threw first pitch at New Yankee Stadium in ballpark's first exhibition on April 3vs. CHI...made 100th career start, June 10 at BOS...lone win: June 28 at NYM...last pitched, July 4 vs. TOR. Was 8-2 with a 4.07 ERA in 15 starts for the Yankees before being placed on the disabledlist on 6/17 with a mid-foot sprain of the Lisfranc ligament and a partial tear of theperoneal longus tendon in his right foot, missing the remainder of the season... theYankees were 12-3 in games he started...Opponents batted .249 (90-for-361, 4HR); LH .261(46-for-176, 4HR), RH .238 (44-for-185, 0HR)... held righthandedbatters hitless over a stretch of 22 consecutiveplate appearances from Aaron Hill's seventh-inningdouble on 4/1 vs. Toronto to Manny Ramirez' double inthe first inning on 4/16 vs. Boston...Despite missing most of the 2008 season, his 46 winssince 2006 are tied for the third-most in the AmericanLeague and eighth-most in the Majors... his .754combined winning percentage over the last threeseasons (2006-08) is the second-highest in the Majorsbehind only Boston's Jon Lester (.771, 27-8)...Has thrown 6.0 or more innings in 77 of his 95 careerstarts (81.1%), going 52-12 in those outings (Yankeesare 60-17)... has lasted at least 7.0 innings in 47 careerstarts (49.5%), going 34-5 in those games... the Yankeesare 38-9 in those starts...Has allowed an average of 0.49HR/9.0IP in his career(34HR, 628.2IP)... is the lowest such mark since BruceBerenyi, who allowed just 0.37HR/9.0IP over his sevenyearcareer from 1980-86 with the Cincinnati Reds andNew York Mets (min. 90GS)... Wang's average is thefourth-lowest among all Major League pitchers sincethe advent of the designated hitter in 1973 (min. 90GS)...Enters the year having not allowed a homer to a right-handed batter in his last 19starts, dating back to 9/4/07 vs. Seattle (Adrian Beltre)... in fact, Beltre's homer is theonly one Wang has allowed to a right-hander over his last 33 starts since San Francisco'sPedro Feliz on 6/23/07 at AT&T Park and the only such homer Wang has allowed overhis last 32 home starts, dating back to 6/23/06 (Florida's Miguel Olivo)... has allowedtwo home runs in a game just three times in his career and only once (4/29/06 vs.Boston) in his last 86 games (85 starts) dating back through 7/3/05 at Detroit...Averaged 14.84 pitches per inning in 2008... since 2005, when he debuted, hasaveraged 14.20 pitches per inning, the second-lowest average in the Majors over thespan behind only Greg Maddux (13.51)...Was 5-0 with a 2.12 ERA in seven starts away from Yankee Stadium... did not throw awild pitch and has gone 21 consecutive starts without a WP, marking the longest suchstreak of his career (credit: Elias)...According to the Elias Sports Bureau, Wang is 23-8 in his career in starts that immediatelyfollow a Yankees loss (with the Yankees as a team going 28-10 in such starts)...Made hi s f i r s t careerOpening Day start on 4/1vs. Toronto, earning thewin in a 3-2 Yankees victoryin the final Opening Daygame at original YankeeStadium... became the thirddifferent Yankee to makean Opening Day start inthe last three years (RandyJohnson-2006 and CarlPavano-2007)... becamethe youngest OpeningDay starter for the Yankeessince Andy Pettitte (25yrs, 290 days) on 4/1/98at Anaheim... owned thefewest Major League wins(46) for a Yankees Opening Day starter since Orlando Hernandez (29-13) in 2000 at Anaheim... became thethird Asian-born pitcher to make an Opening Day start in the Majors, joining Hideo Nomo (three times) andChan Ho Park (two times)... due to the Opener being postponed one day (rain), Wang missed becoming justthe second Yankee to make an Opening Day start on his birthday (3/31)... Catfish Hunter opened the 1976season vs. Milwaukee on his 30th birthday (4/8/76)...Became just the third Yankees pitcher to go 5-0 in the month of April, joining Andy Pettitte (1997) and MikeMussina (2003)... Mel Stottlemyre is the only other Yankee to record five wins in the month of April, going 5-1in both 1969 and 1974... allowed 3ER in 22.0IP over his first three starts of the season, compiling a 1.23 ERA...Threw 6.0 scoreless innings in his second start of the season on 4/6 vs. the Tampa Bay Rays, earning the win ina 2-0 shutout... retired the first 15 batters he faced... the shutout was the Yankees' first in the month of Aprilsince a 2-0 win on 4/10/03 vs. Minnesota...Recorded his fourth career complete game in his third start of the year on 4/11 at Boston, earning the win in a4-1 Yankees victory... limited the Red Sox to only 1ER and 2H in the 9.0-inning effort, facing two batters overthe minimum (0BB, 3K, 93 pitches) for the Yankees' only complete game of the season... was the Yankees' firstcomplete game since Wang accomplished the feat in a 4-0 shutout on 6/6/07 at Chicago (AL)-the Yankees' onlyCG of 2007... was the first complete game thrown by a Yankee at Fenway Park since Mike Mussina on 8/28/02 in a7-0 Yankees victory (three-hitter)... became the first pitcher to allow two or fewer hits in a complete game againstthe Red Sox since Seattle's Felix Hernandez surrendered one hit in a 3-0 win at Fenway Park one year earlier to theday, 4/11/07 (credit: Elias)... was the earliest into a season a Yankees pitcher hurled a complete-game win since2003, when David Wells tossed a three-hit, 2-0 shutout vs. Minnesota in the team's ninth game of the season...Tied a career high, allowing 8R and 8ER on 4/16 vs. Boston at Yankee Stadium in 4.0IP, recording a no-decisionin a 15-9 Yankees victory... was the first time he failed to complete 5.0IP in a start at Yankee Stadium and justthe fifth time in 84 career starts that he failed to reach the mark... entered the fifth staked to a 7-3 lead, butexited after allowing five consecutive hits to start the inning...Earned his 50th career win on 4/22 at Chicago (AL) in his 85th career start... became the first pitcher to accumulate50 wins in 85 or fewer starts since Dwight Gooden won his 50th game in his 82nd start on 6/29/86 w/ the Mets atChicago (NL) and the first Yankee since Ron Guidry reached the total in his 82nd start on 8/13/79 vs. Texas... accordingto the Elias Sports Bureau, Wang earned his 50th career win with a total of just 245 strikeouts... became the first pitcherto reach the 50-win plateau with fewer than 250K since Boston's Bob Stanley won No. 50 on 4/15/81 vs. Baltimorewith 213K... the only other pitcher in the expansion era to do so was Milwaukee's Lary Sorensen, who also had 245Kwhen he won his 50th game on 9/3/1980 at Kansas City...Tossed 7.0 scoreless innings and struck out a season-high nine batters on 4/27 at Cleveland, recording the winin a 1-0 Yankees victory (4H, 2BB, 1HP)... became the first Yankees pitcher to record the win in two April shutoutssince Jimmy Key in 1993...Improved to 6-0 on the season, recording the win in a 5-1 Yankees victory on 5/2 vs. Seattle... also improvedto 7-0 with a 2.39 ERA in seven career starts vs. Seattle, holding them to a .195 batting average over thestretch... according to the Elias Sports Bureau, only Pedro Martinez began his career with a longer winningstreak vs. the Mariners, winning his first 12 starts...Became the first Yankees starter to begin the season 6-0 (from the start of the season) since Mike Mussinawon each of his first seven starts in 2003... over a 30-start span from 6/1/07-5/2/08, went 22-3 with a 3.44 ERA(196.1IP, 75ER)... led the Majors in wins and winning percentage (.880) during the stretch... the Yankees were25-5 in Wang's starts over the span... the last Yankee to win as many games over a 30-start stretch was RonGuidry, who went 22-3 over 30 starts from 5/21/85-4/24/86...Went a career-high six straightstarts without a win from5/7-6/5... had never gonemore than three straight startswithout a victory... sufferedhis first loss of the season on5/7 vs. Cleveland at YankeeStadium in a 3-0 Indiansvictory, opposing eventual22-game winner Cliff Lee...Suffered his second straightlosing decision on 5/18 vs.the Mets in an 11-2 Metsvictory... retired the firstnine batters in order beforeallowing four runs in a35-pitch fourth inning... hadthe start pushed back oneday due to a mild strain in hisright calf... lost consecutivedecisions for just the secondtime in his career (also his firsttwo starts of the 2007 season,4/24 at Tampa Bay and 4/29vs. Boston)... the Yankeeslost three consecutive gamesin which Wang started from5/7-18... was just the secondt ime-al so 4/21-5/1/06(Wang went 0-1 with two nodecisions)...snapped his sixstart winless streak on 6/10at Oakland in a 3-1 Yankeesvictory, allowing only 1ER in7.1IP...Recorded the win on 6/15at Houston, throwing 5.0scoreless innings (6H, 3K)in his final star t of theseason... exited the game in the middle of the sixth after injuring his foot while scoring on a Derek Jetersingle... was examined the next day at NewYork-Presbyterian Hospital in New York by Dr. Stuart Hershon andFoot and Ankle Specialist, Dr. Jason Greisberg... was diagnosed with a mid-foot sprain of the Lisfranc ligamentand a partial tear of the peroneal longus tendon in his right foot... was placed on the 15-day disabled list on6/17 (retroactive to 6/16)... wore a protective boot over his foot and was limited to crutches...Was transferred to the 60-day D.L. on 6/27 when RHP Sidney Ponson was added to the 25-man roster... missedthe final 92 team games of the season. Tied a career-high for the second consecutive season with 19 wins in 2007, going 19-7 with a 3.70 ERA in 30 starts...also established a career-high with 104 strikeouts...the Yankees were 21-9 in games he started...Opponents batted .265 (199-for-751, 9HR); LH .286 (112-for-391, 7HR), RH .242 (87-for-360, 2HR)...Tied for second in the Major Leagues with 19 wins (with Cleveland's Fausto Carmona, the Angels' John Lackey, San Diego's Jake Peavy and Cleveland's C.C. Sabathia), trailing only Boston's Josh Beckett (20)...tied for third in the American League with 10 home wins and a .731 win percentage and was sixth with a 2.75 home ERA (111.1 IP, 34ER)...Induced 32 double-play groundouts this season, tying Cleveland's Fausto Carmona for most opponents GIDP in the Majors in 2007...Leads the Major Leagues with 38 wins (in 63 GS) since the beginning of the 2006 season...also leads the Major Leagues with a .745 winning percentage during that span, recording only 13 losses with a 3.67 ERA (417.1IP, 170ER)...according to the Elias Sports Bureau, became only the second pitcher to lead the Yankees in wins in consecutive seasons during the Joe Torre era (also Andy Pettitte in 1996 and 1997). 4 Became the first Yankees pitcher to record at least 19 wins in consecutive seasons since LHP Tommy John in 1979 (21) and 1980 (22)...was just the fourth Yankee pitcher in the post-war era (since 1946) to accomplish the feat, joining John, RHPs Vic Raschi (1948-51) and Mel Stottlemyre (1968-69). 4 Became the first Yankees pitcher to record consecutive seasons with a .730 or higher winning percentage since Jimmy Key in 1993-94...Went 10-3 after the All-Star break in 2007, tied for second-most wins in the Majors, trailing only teammate Andy Pettitte (11), also San Diego's Jake Peavy and Arizona's Brandon Webb...Was 10-5 with a 3.20 ERA (107.0IP, 38ER) against teams that finished the season with a winning record...Was 9-2 with a 2.59 ERA (76.1IP, 22ER) in 12 starts that followed a Yankees loss in 2007...won his last seven such starts...Tossed at least 6.0 innings in 27 of 30 starts in 2007...has thrown 6.0 or more innings in 66 of his career 80 career starts, going 45-10 in those starts and the Yankees are 52-14 in such starts...Tossed at least 7.0 innings in 14 starts in 2007, going 11-2 in those starts...in his career, is 30-3 in his 40 starts in which he has thrown 7.0 or more innings and the Yankees are 34-6 in those starts...Has recorded 21 wins at Yankee Stadium (33GS) over the last two seasons, the most home victories by any Major League pitcher since the start of 2006...according to the Elias Sports Bureau, he became the first pitcher to win at least 10 games in consecutive seasons at Yankee Stadium since Tommy John (12-5 in 1979 and 11-4 in 1980) and the first right-hander to do so since Mel Stottlemyre (11-6 in 1968 and 12-5 in 1969)...Allowed just 3HR over his final 17 starts of the season (108.1IP), including a career-best 55.2-inning homerless stretch from 7/3-8/13...surrendered just two HRs to right-handed batters this season (Pedro Feliz on 6/23 at San Francisco and Seattle's Adrian Beltre on 9/4 at Yankee Stadium)...the Beltre HR was his first HR allowed to a right-hander at home since 6/23/06 (Florida's Miguel Olivo), a span of 22 home starts...Wang's career average of 0.51 HR/9.0IP (30HR, 533.2IP) is the lowest since Bruce Berenyi allowed just 0.37HR/9.0IP over his seven-year career from 1980-86 with Cincinnati and the Mets (min. 75GS)...Was 12-3 with a 2.27 ERA in 2007 against teams with a winning record at the time he faced them (111.0IP, 28ER)...Started and recorded the win in three of the Yankees' five shutout victories this season...Averaged an American League-low 14.35 pitches per inning, trailing only San Diego's Greg Maddux (13.65) and Atlanta's Tim Hudson (14.11) among all Major League pitchers...Had 34 assists, tying Chicago's Mark Buehrle for third-most among all American League pitchers (0E)...The Yankees have won 55 of his 80 career starts (68.8%)...Opened the season on the 15-day disabled list from 3/31-4/23 (missed 18 team games) with a strained right hamstring...suffered the injury on 3/23 while doing conditioning exercises at Legends Field during Spring Training...Made one rehab start with Single-A Tampa on 4/19 vs. Ft. Myers (5.0IP, 5H, 3ER, 1BB, 4K)...was returned and reinstated from the 15-day D.L. on 4/24...Surrendered a season-high two home runs in a 7-4 loss on 4/29 vs. Boston, equaling his career high (now done three times)...hadn't allowed two homers in the same game since 6/28/05 at Baltimore-a span of 41 consecutive starts...Fell five outs shy of a perfect game on 5/5 vs. Seattle, retiring the first 22 batters he faced...surrendered a solo-HR to Seattle's Ben Broussard with one out in the eighth...according to the Elias Sports Bureau, the last time a perfect game ended in the seventh inning or later by a home run was on 4/20/90, when Oakland's Ken Phelps hit a pinch-hit home run off Seattle's Brian Holman with two outs in the ninth...the performance marked the first time a Yankees starter pitched into the eighth inning in 2007 (28 games)...was the second time in five days that a Yankees pitcher took a no-hitter into the seventh (Phil Hughes went 6.1 innings on 5/1 at Texas before being removed due to injury)...Had an 0-for-27 stretch vs. opposing hitters snapped by the Broussard HR...according to the Elias Sports Bureau, it was the longest such streak by a Yankees pitcher this season...Recorded his third career complete game on 6/6 at the Chicago (AL) in a 5-1 Yankees victory...was the Yankees' only complete game of the season and first since Randy Johnson's 4-2 loss on 8/24/06 at Seattle (a span of 92 team games without a complete game)...Allowed a solo HR to Chad Tracy in the fourth inning of the Yankees' win on 6/12 vs. Arizona, snapping a 46.1IP stretch without allowing a home run (spanning eight starts)...did not induce a double-play grounder for the first time this season, snapping a streak of nine consecutive starts from the beginning of the season with at least one GIDP...according to the Elias Sports Bureau, it was the longest streak by a Yankees pitcher to start a season since Tommy John had at least one GIDP in each of his first 17 starts in 1979...Struck out a career-high 10 batters in 8.2IP in 6/17 win vs. the Mets, surpassing his previous single-game career high of eight strikeouts on 4/16/06 at Minnesota...was the first 10-strikeout game by a Yankees pitcher since Randy Johnson recorded 11 strikeouts on 7/19/06 vs. Seattle...also was the only double-digit strikeout game by a Yankee this season...Pitched 7.0 scoreless innings in 7/3 win vs. Minnesota, his first scoreless outing since 8/30/06 vs. Detroit (7.2IP)...walked the first three hitters of the fourth inning, marking the first and only time in his career he opened an inning by walking the first three batters...Won a career-high seven consecutive decisions over nine starts from 6/1-7/14, with a 2.89 ERA over the stretch (62.1IP, 20ER)...was the longest win streak by a Yankees starter in 2007...Allowed career highs with 8R and 8ER in 2.2IP in an 8/8 loss at Toronto...was the shortest start of his Major League career...Had his streak of 47 consecutive starts without allowing an unearned run snapped on 8/25 at Detroit, when Brandon Inge advanced to third on a passed ball and subsequently scored on a wild pitch during the fifth inning...was the longest streak without allowing an unearned run in Yankees history...Recorded the win on 9/9 at Kansas City, improving to 4-0 with a 4.66 ERA in six career starts vs. the Royals and 15-1 with a 3.17 ERA in 21 career starts against the entire AL Central...Won his final start of the season on 9/26 at Tampa Bay for his 19th victory of the season, clinching a postseason appearance for the Yankees...allowed a two-run home run to Carlos Pena in the fifth inning, snapping a stretch of 110.0 homerless innings for Yankees starters. Developed into one of the game's elite starters in only his second season in the Majors, finishing second behind only Minnesota's Johan Santana in American League CY Young Award Voting by the BBWAA...went 19-6 with a 3.63 ERA in 34 appearances (33 games started)...the Yankees were 22-11 in games he started...opponents batted .277 (233-for-841, 12HR); LH .275 (103-for-375, 5HR), RH .279 (130-for-466, 7HR)...Tied for first in the American League with 19 wins, ranked second with 14.0 pitches per inning, tied for third with a .760 winning percentage, tied for fourth with a 3.03 home ERA, fifth with 218.0 IP and tied for sixth with 33 games started...his 42 assists were most among all American League pitchers...had the lowest HR rate in the Majors (one every 18.17IP) and hasn't allowed two home runs in a game since 6/28/05 at Baltimore (a span of 40 starts)...With 19 victories, surpassed Chan Ho Park (18-10 in 2000) for the most wins in a single season by an Asian-born pitcher...pitched at least 6.0 innings in 24 of his 33 starts...was 9-2 with a 3.01ERA (89.2IP, 30ER) in 13 starts in 2006 that followed a Yankee loss...won nine straight decisions at Yankee Stadium from 4/21-8/2...in the last five seasons, only Wang, Roger Clemens (nine straight in 2002) and Randy Johnson (nine straight in 2005) have won as many as nine straight games in a single season at Yankee Stadium...Didn't strike out more than three batters in 23 consecutive starts from 4/21-8/18, the longest streak of its kind in the Majors since Kirk Rueter had had no more than three strikeouts in 26 straight starts (2003-'04)...according to the Elias Sports Bureau, his streak was the longest by a Yankees' pitcher since Urban Shocker made 23 straight starts with three-or-fewer strikeouts (1926-'27)...Made the start in the Yankees' 2006 home opener on 4/11 vs. Kansas City, recording no decision in a 9-7 Yankees' win...on 5/17 vs. Texas, recorded his third straight victory in a 4-3 Yankees' win...had not allowed an earned run in 15 straight innings until Texas scored two in the eighth...equaled his single-game career high with seven runs allowed in 5/22 loss at Boston (also allowed seven runs on 6/10/05 at St. Louis)...recorded his shortest outing of the season as a starter (4.0IP) on 6/1 at Detroit, recording no decision in a 7-6 Tigers' win...made first relief appearance of the season and recorded his first career save in 6-5, 10-inning win at Baltimore on 6/3 (0.2IP, 2H)...According to the Elias Sports Bureau, he became the first Yankee to earn a save between his normal turns in the rotation since John Candelaria in 1988...prior to Wang, only three pitchers in the Majors had done it since: Bob Walk (1990), Terry Mulholland (1999) and Daniel Cabrera (2004)...Combined with three Yankees' relievers on a five-hit, 1-0 shutout win on 6/13 vs. Cleveland, marking his third straight victory and sixth in his last seven decisions...recorded the loss in his first career compete-game on 6/18 at Washington...allowed two-run "walk-off" home run by 3b Ryan Zimmerman in the ninth inning, the 12th "walk-off" home run vs. the Yankees since 1996 and the first since Toronto's Vernon Wells on 7/28/2004 in a 3-2, 10-inning loss at Rogers Centre (off Proctor)...was also the first "walk-off" home run vs. a Yankee starter since 7/28/95 (Minnesota's Dan Masteller off Jack McDowell) in a 5-3 loss at the Metrodome...allowed a first-inning run for the first time in his last 14 starts on 7/17 vs. Seattle...Recorded the longest outing of his career and his first complete-game shutout on 7/28 vs. Tampa Bay, limiting the Devil Rays to two hits in a 6-0 Yankees' win (9.0IP, 2H, 2BB, 1K)...won a career-high five straight starts from 7/8-8/2...during the five-game stretch, allowed just 7ER in 38.1IP (1.64 ERA)...On 8/8 at the Chicago White Sox-in the first appearance of his career vs. Chicago-recorded no decision in a 6-5, 11-inning White Sox win...did not allow a run in 19.0 consecutive innings pitched (over four starts) before allowing three runs in the second inning...according to the Elias Sports Bureau, it was the longest scoreless streak by a Yankee starter since LHP Andy Pettitte had a streak of 22.1 scoreless innings in August of 2003...Allowed a single-game career-high 13 hits on 8/13 vs. the Los Angeles Angels of Anaheim, suffering the loss in a 5-3 Angels' win...had allowed only one first-inning run in his previous 18 starts before allowing three runs in the first inning of the loss...was 11-2 with a 2.96 ERA in his final 15 starts of the season (from 7/8-9/27), allowing 33ER in 100.1IP (106H, 23BB, 36K)...made the start in Game One of the Division Series vs. the Detroit Tigers at Yankee Stadium, allowing 8H and 3ER in 6.1IP (1BB, 4K, 1HR) to earn his first career postseason win...became the first Taiwan-born pitcher to win a postseason game in the Major Leagues. Despite beginning the season at Triple-A Columbus, emerged as one of the Yankees' most dependable starting pitchers in his first Major-League season...was 8-5 with a 4.02 ERA in 18 appearances (17 games started)...the Yankees were 11-6 in games he started...opponents batted .256 (113-for-441, 9HR); LH .258 (55-for-213, 6HR), RH .254 (58-for-228, 3HR)...pitched at least 6.0 innings in 15 of his 17 starts...made three appearances (two starts) with the Yankees in spring training, posting a 3-0 record with a 1.00 ERA (9.0IP, 6H, 1ER, 3BB, 6K)...Made six starts with Triple-A Columbus (four to begin the season and two on a rehab assignment), going 2-1 with a 4.24 ERA (34.0IP, 40H, 16ER, 6BB, 21K)...was the Clippers' Opening-Night starter at Charlotte on 4/7 and earned the win, allowing 6H and 4ER in 6.0IP...made three additional starts with Columbus before being recalled by the Yankees on 4/27...Made his Major-League debut on 4/30 vs. Toronto and recorded no decision in a 4-3 Yankees' win...was the first Yankee to make his Major-League debut as a starting pitcher since LHP Brad Halsey on 6/19/04 vs. Los Angeles at Dodger Stadium and the first to do it at Yankee Stadium since RHP Bret Jodie on 7/20/01 vs. Toronto...recorded his first Major-League victory on 5/10 vs. Seattle, allowing 4H and 3ER in 7.1IP...on 5/17 at Seattle-his second straight start vs. the Mariners-recorded his second straight victory in a 6-3 Yankees' win...in his two starts vs. Seattle, LH batters were 4-for-25 (were 11-for-28 in first two starts)...Won a season-high three straight games from 5/10-25...made his first career relief appearance on 5/29 vs. Boston in a 7-2 Red Sox win (4.2IP, 6H, 2ER, 1BB, 2K)...on 6/4 at Minnesota, recorded no decision in a 4-3, 10-inning Yankees' win...allowed three-run fourth-inning home run to Jacque Jones, his first home run allowed in 2006 (40.2IP)...according to the Elias Sports Bureau, it was the longest such streak by Yankee pitcher beginning his Major-League career since Bobby Munoz in 1993 (41.2IP) and the third longest in the last 50 years (Bob Wiesler started his Yankee career with 77.0 homerless innings over three seasons, 1953-1955)...Tossed a season high 8.0 innings on 6/18 vs. the Chicago Cubs, recording the victory in an 8-1 Yankees' win...on 7/3 at Detroit, combined-with Gordon and Rivera-on a 1-0 victory (7.0IP, 5H, 0R, 1BB, 2K)...it was the Yankees' first 1-0 victory since 7/22/04 vs. Toronto and their first on the road since 6/22/02 at San Diego...was placed on the 15-day disabled list from 7/13-9/6 with inflammation of the right shoulder (missed 52 games)...made two rehab-assignment starts for Triple-A Columbus and was 0-1 with a 4.50 ERA (8.0IP, 13H, 4ER, 1BB, 5K, 2HR)...On 9/8 vs. Tampa Bay-in his first Major League appearance since 7/8-recorded the loss in a 7-4 Devil Rays win...on 9/19 vs. Baltimore, recorded no decision in a 3-2 Yankees' win (8.0IP, 7H, 2ER, 1BB, 4K)...tied a season-high with 8.0 IP (also on 6/18 vs. the Chicago White Sox)...recorded nine assists, two shy of the franchise- and Major-League record for pitchers (11, held by five pitchers, including the Highlanders' Al Orth, 1906; and George McConnell, 1912)...walked a single-game career high six batters in his final start of the season-on 9/30 at Boston-and received the loss in a 5-3 Red Sox victory (6.2IP, 4H, 3ER, 4K)...Made first career postseason appearance in Game Two of the Division Series versus the Angels...allowed 4R (1ER) in 5.2IP to suffer the loss...at 25 years, 188 days, became the youngest pitcher to start a post-season game for the Yankees since Andy Pettitte started Game Five of the 1997 ALDS versus Cleveland at 25 years, 113 days. Was the recipient of the Kevin Lawn "Pitcher of the Year" Award, honoring the Yankees' topMinor League Pitcher...combined to go 11-6 with a 3.50 ERA in 24 games (23 starts) with Double-A Trentonand Triple-A Columbus...began the season at Trenton, going 6-5 with a 4.05 ERA in 18 starts before being promotedon 7/26...struck out a season-high 10 batters on 4/25 vs. Reading, pitching 7.0 shutout innings (3H) toearn the win...was named Eastern League "Pitcher of the Week" from 4/19-25, going 1-0 with a 0.69ERA intwo starts (13.0IP, 9H, 1ER, 3BB, 16K)...was promoted to Columbus on 7/26 and suffered the loss that day inhis Triple-A debut at Richmond (6.0IP, 5ER)...won each of his other five games (four starts) with the Clippers,going 5-0 with a 1.05 ERA (34.1IP, 4ER)...pitched for Taiwan at the 2004 Olympic Games in Athens, Greece inAugust...on 8/15 vs. Australia, pitched 7.0 scoreless innings (3H) to earn the victory...received a no-decisionon 8/21 vs. Japan, allowing 3ER and 8H in 6.2IP...pitched a complete-game shutout in his final regular seasonstart with the Clippers, allowing 7H and striking out eight on 9/3 vs. Toledo...was ranked as the #10 prospectin the Yankee organization by Baseball America. Spent the majority of the season with Double-A Trenton, going 7-6 with a 4.65 ERA in 21starts...threw complete-game four-hit shutout on 5/2 at New Britain...was named to the World All-Star Team forthe fifth annual Futures Game on 7/13 at Chicago...was placed on the disabled list twice (6/14-24 and 7/1-20)with a blister on his right middle figer...made one rehab start with the Gulf Coast Yankees on 7/9, throwing three shutout innings...struck out a season-high 10 batters in 6.0 IP and earned the win on 7/25 at New Haven...was placed on the D.L. for a third time from 8/22 through the end of the season with a right shoulder strain. Was 6-1 with a 1.72 ERA in 13 games started for Staten Island of the New York-Penn League...rankedsecond in the league in ERA and led Staten Island with 78.1IP...was selected to the post-season All-StarTeam...did not allow more than three earned runs in any of his 13 starts...in his only loss of the season on 8/6 at Hudson Valley, allowed two unearned runs in 7.0IP...was 2-0 with a 1.17 ERA in two postseason starts, and was the winning pitcher in Staten Island's championship-clinching game vs. Oneonta...was ranked as the #5prospect in the Yankee organization by Baseball America. Missed the entire season rehabilitating from arthroscopic surgery on his right shoulder performed on4/3/01. In his first professional season was 4-4 with a 2.48 ERA in 14GS for Staten Island of the New York-PennLeague...lead the league with two complete games and one shutout...ranked fourth with 87.0IP and eighth withhis 2.48 ERA...allowed only two home runs the entire season, both on 7/21 vs. Lowell...struck out a career high11 batters in his complete-game shutout on 9/2 at Oneonta...made two postseason starts, going 1-0 with a 2.86ERA (12.2IP, 4ER) as Staten Island won the NY-Penn League championship. 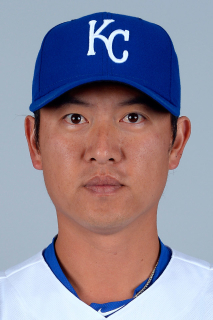 September 22, 2016 Kansas City Royals released RHP Chien-Ming Wang. September 17, 2016 Kansas City Royals designated RHP Chien-Ming Wang for assignment. September 17, 2016 Kansas City Royals activated RHP Chien-Ming Wang from the 15-day disabled list. August 31, 2016 Kansas City Royals placed RHP Chien-Ming Wang on the 15-day disabled list. Right biceps tendinitis. April 3, 2016 Kansas City Royals selected the contract of RHP Chien-Ming Wang from Omaha Storm Chasers. January 7, 2016 Kansas City Royals signed free agent RHP Chien-Ming Wang to a minor league contract and invited him to spring training. January 7, 2016 RHP Chien-Ming Wang assigned to Omaha Storm Chasers. November 6, 2015 RHP Chien-Ming Wang elected free agency. August 4, 2015 Tacoma Rainiers activated RHP Chien-Ming Wang from the temporarily inactive list. July 31, 2015 Tacoma Rainiers placed RHP Chien-Ming Wang on the temporarily inactive list. July 11, 2015 Seattle Mariners signed free agent RHP Chien-Ming Wang to a minor league contract. July 11, 2015 RHP Chien-Ming Wang assigned to Tacoma Rainiers. June 19, 2015 Gwinnett Braves released RHP Chien-Ming Wang. June 17, 2015 Gwinnett Braves activated RHP Chien-Ming Wang from the 7-day disabled list. June 11, 2015 Gwinnett Braves placed RHP Chien-Ming Wang on the 7-day disabled list. May 21, 2015 Gwinnett Braves activated RHP Chien-Ming Wang from the 7-day disabled list. May 15, 2015 Gwinnett Braves placed RHP Chien-Ming Wang on the 7-day disabled list retroactive to May 13, 2015. April 6, 2015 RHP Chien-Ming Wang assigned to Gwinnett Braves. November 10, 2014 Atlanta Braves signed free agent RHP Chien-Ming Wang to a minor league contract and invited him to spring training. July 17, 2014 RHP Chien-Ming Wang assigned to Charlotte Knights. July 16, 2014 Chicago White Sox signed free agent RHP Chien-Ming Wang to a minor league contract. July 13, 2014 Louisville Bats released RHP Chien-Ming Wang. March 28, 2014 RHP Chien-Ming Wang assigned to Louisville Bats. December 18, 2013 Cincinnati Reds signed free agent RHP Chien-Ming Wang to a minor league contract and invited him to spring training. October 1, 2013 RHP Chien-Ming Wang elected free agency. August 27, 2013 Toronto Blue Jays sent RHP Chien-Ming Wang outright to Buffalo Bisons. August 26, 2013 Toronto Blue Jays designated Chien-Ming Wang for assignment. August 24, 2013 Toronto Blue Jays selected the contract of RHP Chien-Ming Wang from Buffalo Bisons. July 5, 2013 Toronto Blue Jays sent Chien-Ming Wang outright to Buffalo Bisons. July 3, 2013 Toronto Blue Jays designated Chien-Ming Wang for assignment. June 11, 2013 Toronto Blue Jays signed free agent RHP Chien-Ming Wang. June 7, 2013 Scranton/Wilkes-Barre RailRiders released RHP Chien-Ming Wang. April 19, 2013 Scranton/Wilkes-Barre RailRiders activated RHP Chien-Ming Wang from the 7-day disabled list. April 4, 2013 RHP Chien-Ming Wang assigned to Scranton/Wilkes-Barre RailRiders. March 23, 2013 New York Yankees signed free agent RHP Chien-Ming Wang to a minor league contract. November 3, 2012 RHP Chien-Ming Wang elected free agency. October 15, 2012 Washington Nationals activated RHP Chien-Ming Wang. September 4, 2012 Washington Nationals activated RHP Chien-Ming Wang from the 15-day disabled list. August 16, 2012 sent RHP Chien-Ming Wang on a rehab assignment to Harrisburg Senators. July 23, 2012 Potomac Nationals sent RHP Chien-Ming Wang on a rehab assignment to Harrisburg Senators. July 18, 2012 Chien-Ming Wang assigned to Potomac Nationals. July 13, 2012 sent RHP Chien-Ming Wang on a rehab assignment to Harrisburg Senators. July 3, 2012 Washington Nationals placed RHP Chien-Ming Wang on the 15-day disabled list retroactive to July 1, 2012. Right hip strain. May 22, 2012 Washington Nationals activated RHP Chien-Ming Wang from the 15-day disabled list. May 9, 2012 sent RHP Chien-Ming Wang on a rehab assignment to Syracuse Chiefs. May 4, 2012 sent RHP Chien-Ming Wang on a rehab assignment to Hagerstown Suns. May 3, 2012 Potomac Nationals sent RHP Chien-Ming Wang on a rehab assignment to Harrisburg Senators. April 28, 2012 Chien-Ming Wang assigned to Potomac Nationals. November 4, 2011 Washington Nationals signed free agent RHP Chien-Ming Wang. October 30, 2011 RHP Chien-Ming Wang elected free agency. July 29, 2011 Washington Nationals activated RHP Chien-Ming Wang from the 60-day disabled list. July 19, 2011 sent RHP Chien-Ming Wang on a rehab assignment to Syracuse Chiefs. July 14, 2011 Potomac Nationals sent RHP Chien-Ming Wang on a rehab assignment to Harrisburg Senators. July 13, 2011 sent RHP Chien-Ming Wang on a rehab assignment to Potomac Nationals. July 7, 2011 sent RHP Chien-Ming Wang on a rehab assignment to Harrisburg Senators. July 2, 2011 Hagerstown Suns sent RHP Chien-Ming Wang on a rehab assignment to Potomac Nationals. June 27, 2011 Chien-Ming Wang assigned to Hagerstown Suns. March 28, 2011 Washington Nationals placed RHP Chien-Ming Wang on the 60-day disabled list. Recovering from July 2009 right shoulder surgery. December 16, 2010 Washington Nationals signed free agent RHP Chien-Ming Wang. December 3, 2010 RHP Chien-Ming Wang elected free agency. November 10, 2010 Washington Nationals activated RHP Chien-Ming Wang from the 60-day disabled list. April 4, 2010 Washington Nationals placed RHP Chien-Ming Wang on the 60-day disabled list. Recovering from July 2009 right shoulder surgery. February 19, 2010 Washington Nationals signed free agent RHP Chien-Ming Wang. December 12, 2009 RHP Chien-Ming Wang elected free agency. November 12, 2009 New York Yankees activated RHP Chien-Ming Wang from the 60-day disabled list. July 31, 2009 New York Yankees transferred RHP Chien-Ming Wang from the 15-day disabled list to the 60-day disabled list. July 5, 2009 New York Yankees placed RHP Chien-Ming Wang on the 15-day disabled list. May 22, 2009 New York Yankees activated RHP Chien-Ming Wang from the 15-day disabled list. May 12, 2009 New York Yankees sent RHP Chien-Ming Wang on a rehab assignment to Scranton/Wilkes-Barre Yankees. April 24, 2009 New York Yankees placed RHP Chien-Ming Wang on the 15-day disabled list retroactive to April 19, 2009. Weakness in the adductor muscles of both hips.